I don’t know who said that, but he probably was a runner. A runner who ran in the cold, wet, rain. I admit that I would take the heat over the cold any day, but I would go insane if I had to spend the entire winter on the treadmill just to stay warm. But figuring out what to wear for all kinds of different weather is not as easy as it sounds. Inevitably, I end up dressing too warmly at the beginning of the season, freezing for the first mile and drenched with sweat for the second. Part of it is because I haven’t quite adjusted to the cold yet. Fifty degrees absolutely freezing when I’ve spent the summer running in the 80s or 90s! A lot of people will use the rule of thumb, “dress like it’s 15-20 degrees warmer than it really is” to help them decide what to wear. 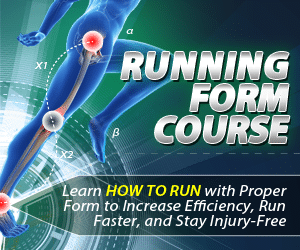 That might be helpful for some runners, but I don’t find that particularly useful. I try to imagine going for a walk in 65 degree weather (that’s 18C for my metric friends) and what I’d be wearing would be jeans, long sleeves, and probably even a vest. But if I’m running in 45 degrees (7C) I would roast in that! For me, I’m really cold when I’m not moving much and I’m really warm when I’m running so this rule of thumb just doesn’t work well. So I need my cheat sheet. I have a chart that’s taped right next to my thermostat. It has cute drawings of the types of running gear I’m supposed to wear at what temperature. If you’d like to make one of your own, there are several “how to dress” charts online that you can print, and that’s where I started. But since everyone has a different cold response, it’s a good idea to either make yours from scratch or modify one you find online so it’s customized to you. The first place I’d start is finding your glove point. I get very cold hands even in mild weather, so for me that’s 58 degrees (that’s about 14 celsius). Even if I’m wearing shorts and a tank, I’ve got gloves on too. 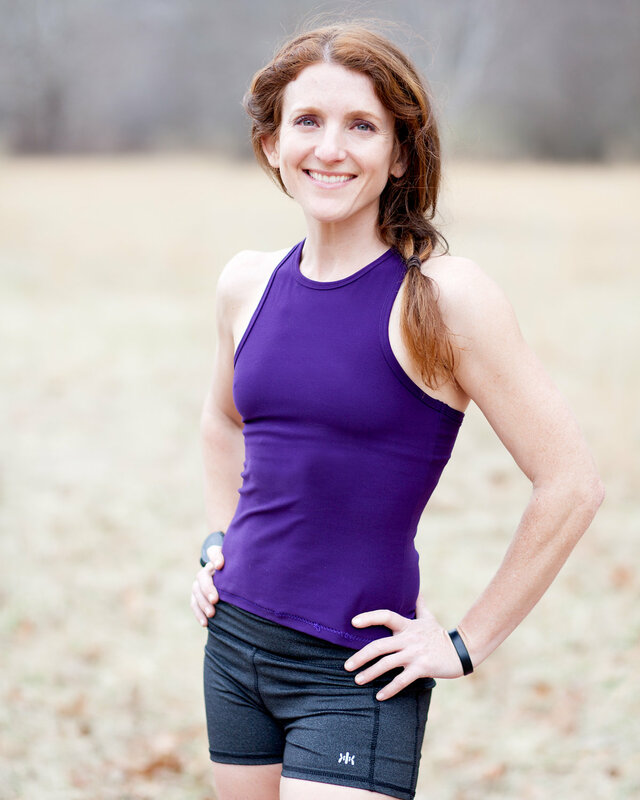 If I miscalculate and my hands do warm up too much, I can tuck them in a pocket or even my sports bra for the rest of the run. For other people, their hands might not get cold until it’s in the 40s (or somewhere between 5-10 degrees celsius) so experiment with that for yourself. It’s better to have a light pair with you that you can stash away somewhere rather than have miserably cold hands. The next point I’d figure out is your shorts point. That’s the temperature where shorts are really a no go and capris or long tights are a better choice. 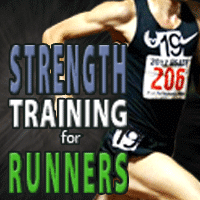 This will be different weather you are running a hard workout or race or if you are just going out for an easy run. 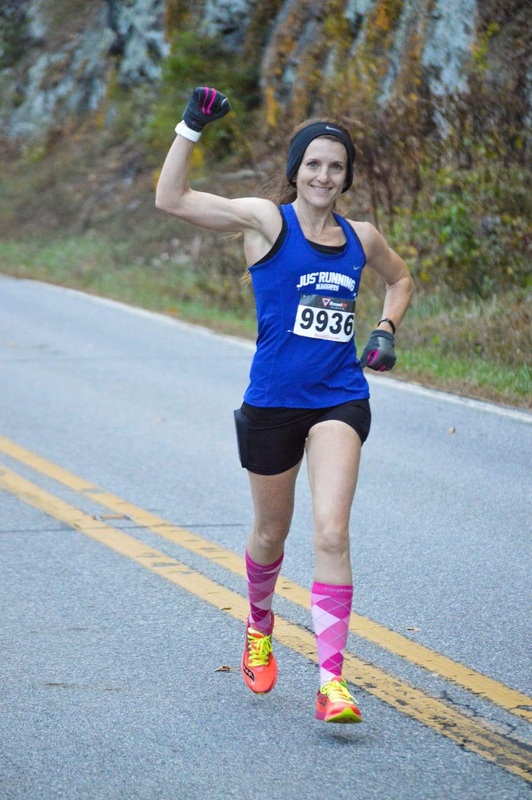 For me, if it’s sunny and clear, I’ve got a hard workout or race, and it’s 45 degrees, I will wear shorts with knee-high compression socks, a tank top and gloves. But if it’s just an easy run and it’s cloudy, rainy, or windy, it’s getting close to the point that capris are a better choice. I’m definitely not wearing shorts below 40 degrees (about 4C) unless I am racing hard. What about sleeves? Sleeves are definitely up to personal preference. I personally am all or nothing with sleeves. It’s either a tank top or it’s long sleeves. Short sleeves don’t add much if any warmth and I don’t like the way most t-shirts rub under my arms, so I rarely wear them. But other runners find them the perfect choice on cool but not cold days. A nice convertible option is separate arm sleeves. You wear a tank or short sleeve shirt and then have arm sleeves on. When you get too hot, you simply push them down to your wrists. If the wind picks up again, you can pull them back up. Once you have figured out the basics, it’s time to look at the extra layers. Dressing in layers is a great idea because even with the most detailed chart at home, you can’t foresee everything. Runners have vests, jackets, waterproof layers, headbands, hats, mittens and gloves. All of them can be important additions to your running gear. My absolute favorite piece of cold weather gear is my running vest. It keeps my torso warm without over heating my arms. Sometimes when I overdress and get too hot, I can even take my base layer long sleeves off and tie that around my waist and put the vest back on solo and that keeps the most crucial parts of me nice and warm. Another thing to remember is that the first mile is a liar. If you are dressed properly, you will be cold the first mile or at least the first ten minutes. You can either accept that fact or you do something about it so that you don’t have to go through that miserable mile. What I sometimes do is plan to be slightly overdressed (but happy!) the first mile and I will purposely do my first mile in a loop around my house. Once I get warmed up, I can toss my extra layer on my front porch and get on with my run perfectly comfortably. 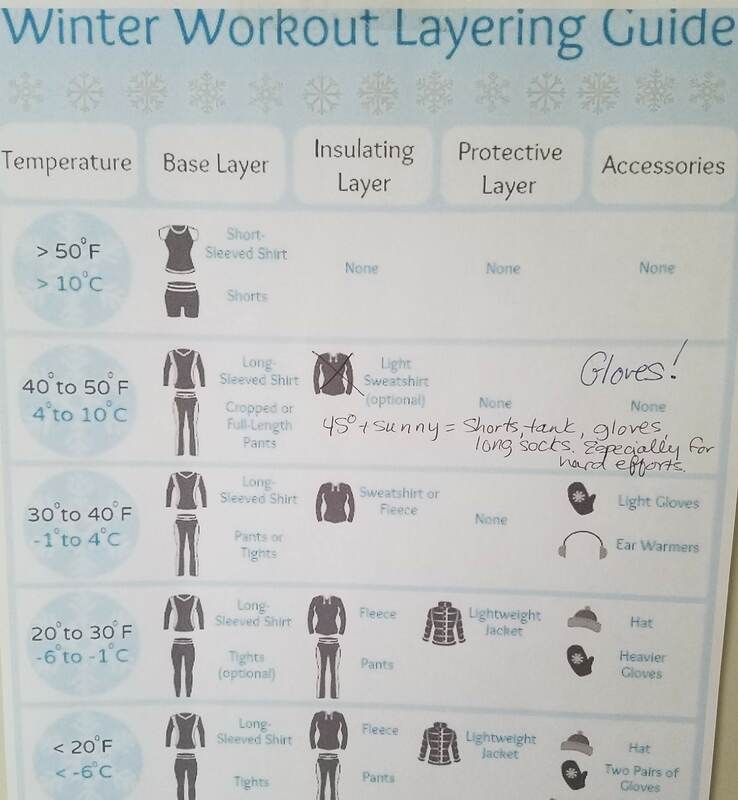 Other people might decide to stash their extra clothes in some bushes somewhere but that doesn’t always make the neighbors happy, so I prefer to just admit that I’m a complete wimp with the cold and plan ahead! Of course wet and windy conditions will amplify the cold so making notes on your chart for how you feel in those conditions is a great idea. It can be a challenge finding the right waterproof gear for runners, however, because inevitably you will get very warm underneath. I have found that especially in racing in the rain, it’s best to accept that you will get wet, but take precautions to be sure that you are warm without overheating. This could mean an extra layer over your base layer or it could be a waterproof vest instead of a full jacket, depending on the temps. It takes a little trial and error to figure out what works for you and what doesn’t, but making notes can be really helpful. Because, I promise you that you will forget what you wore last year at what temp in what conditions. Dressing for the chilly weather can be a bit more complicated than summer running where it’s just hot all the time but you really have no major decisions to make when it comes to clothing. But having the right gear can keep you running no matter what the weather and keep you warm the entire time. Helpful. Thanks for posting. 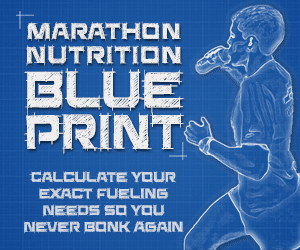 As I do virtually all my training on the treadmill, it's only an issue for races. Of course, we're all different. Shorts work for me down into the 30s if I'm racing. Gloves, when my hands need warmth (somewhere in the 40s), don't work. The fingers get cold, so it's mittens or nothing. My mittens are always old socks (usually the free pair they give you in the hospital - I always save them). That way, if I need to chuck them on course, it's no great tragedy. On colder days, I double up on the gloves. Still trying to figure out the torso and arm thing, but your post gives me some ideas and links. Any day below 60 or so, I do wear a large garbage bag to keep in warmth (and deflect any precip), at least until the gun, and sometimes in through the first mile or so. I've almost always overdressed up top, and I'm sure that's cost me some time, but, being a wimp, I prefer to be comfortable than to be fast. Yes, everyone is so different, Jerry! That's why the charts and the rules of thumb have to be tweaked for everyone. Or you could solve the whole problem by moving to Arizona. True, but them I'd be on the treadmill in the summer! Run with Me This Winter in San Diego!